Having the Internet in your pocket plus a world’s worth of maps on your lap along with your video, music, messaging and email on demand is truly a wonderful thing. If you are able to install different RV apps to make life on the road so much more convenient and simpler, that would be something remarkable as well. Having your smartphone facilitate your road adventures so you are basically self-contained when you stop for the night is nothing short of awesome. You would not have to pay for a clubhouse, showers, a swimming pool or hookups since all you really need is a parking space, and the best RV apps can provide that info easily. The ultimate RVing resource for locating not just overnight stops but also other RV services and campgrounds, the Allstays Camp and RV offers you an exceptionally broad database that boasts over 29,000 listings that include military FamCamps, RV resorts, overnight parking options that include Walmart branches that allow overnight stays, public campgrounds, and many more. The app also comes with RV service stations, propane filling locations, dump stations and service centers. It also provides marked indications for road grades, rest areas, low clearance bridges and construction alerts, along with tracking of some of the basic laws of the state. Offering thousands more places compared to other sources, the app is a true universal app for iPad, iPhone and Touch as well, with maps that add points in real time as you scroll. If you just want to view campgrounds or tenting with no extras, just one touch will do it. The map can be filtered by over 30 amenities and by type, giving you hundreds of possibilities. Get information on over 30,000 campgrounds in the US and Canada, as well as national and state forests and parks, county/city parks, KOA, Good Sam, Passport America, and so much more. Owning a RV takes a special breed. You should not only love seeing places but also having adventures and collecting memories as you cover the miles. Building a comfort zone is not your cup of tea since you always enjoy seeing what is outside your neighborhood. Designed specifically for the true blue RVer, the CoPilot RV GPS Navigation App offers genuine value for money and comes with a one-time fee that provides unlimited use plus free map updates. Avoid unexpected delays en route using the included 12 months real-time traffic service. If high data bills scare you, the app offers reliable offline navigation so you won’t have to wait while an online navigation app buffers up to find what direction you are heading while you struggle to find a good signal. Taking the stress out of driving so you always stay safe, the app calculates your route based on the size and class of your RV to prevent those exasperatingly costly and dangerous low-bridge encounters. You also have lane arrows and ClearTurn™ view with genuine road signage so you know which lane to take for you to maneuver safely through complex intersections and lane changes ahead of time. When RVs have to go… we know where to go!™ Thus proclaims the creator of the Sanidumps.com Android app. The website comes with a map locator for RV Dump Stations, with this free companion app. A useful means of finding dump stations in conjunction with Allstays, the premium version provides step-by-step driving directions and accommodates 20 favorites, not just 1. GPS coordinates are also displayed for each site. With all results displayed on Google Maps, you can locate RV dump stations from your GPS location while on the road. You can also search based on a city of your preference. Information about RV dump stations is up-to-date, with your favorite dump stations available for viewing while offline. One of the advantages of traveling in an RV is that you still have many of the comforts of home, and this includes a kitchen. It may be small, often the stove only comes with two burners and counter space is severely limited, but you can cook great tasting and nutritious meals while you are on the road. Not only can cooking in an RV add to your sense of adventure, it is also a great way to save some money. 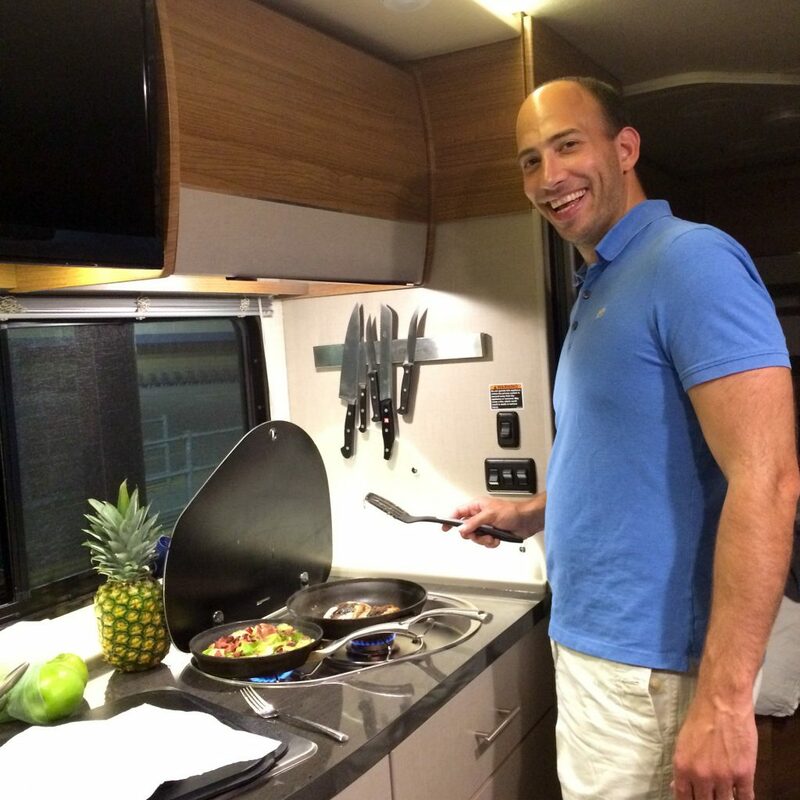 Here are 5 of the top dishes that you can easily cook in your RV. After a long day driving or exploring the area the last thing you want to do is spend hours putting a meal together. Grill cheese sandwiches are delicious and easy to make, even on a small stovetop. All you need is a frying pan, butter, cheese and sliced bread, and in a matter of minutes you can sit down and enjoy dinner. Nothing is easier than spaghetti, and it is also a dish that almost everyone is familiar with and loves. If you are used to making your own sauce then you might want to bring a jar with you, otherwise settle for a store bought brand. The goal is to keep it simple while you are on vacation, so you don’t want to spend hours making your own sauce. Simply boil the pasta on one burner and warm the sauce on the other. When both are finished serve and enjoy. There is something special about pancakes for breakfast when you are on vacation, and they taste even better when you can sit outside and enjoy a spectacular view. Thanks to the jugs of batter that you simply add water to and shake, it is also incredibly easy to make a lot of pancakes in an RV. Pour the batter into a heated skillet, and flip the pancakes when the edges are golden. Serve on a plate with syrup with any fresh fruit that you may have found on the way and you have a delicious and filling breakfast that will keep you going, at least until lunchtime. Some people are hesitant to use the oven in the RV. It is small, will heat the inside of the RV up to uncomfortable temperatures and doesn’t always cook food the same as your oven at home, but it is fully functional. A grill bag is an easy way to make dinner in the tiny oven, without leaving a huge mess to clean up. Simply add small potatoes, half ears of corn or any other veggies that grill well, along with small pieces of meat. Season to taste, fold the foil packet up and let it marinate while you are out enjoying your day. When you get back to the RV pop the packets in the oven for 20-25 minutes and you are ready to enjoy a hot dinner. Whether you just put butter and sour cream on your potato or load it up with cheese, broccoli and other toppings they are easy to make in a RV. Simply follow the same steps that you do at home, just make sure you use aluminum foil and clean up will be as easy as it was to make dinner. Replacing your RV GPS unit with a smartphone app- is it a good idea? You depend on your RV GPS unit to provide you with reliable and concise directions. Since it is configured to the exact specifications of your RV you can confidently drive down unfamiliar roads without worrying about getting stuck under low hanging bridges or in areas that aren’t designed to handle your large recreational vehicle. Chances are you also have easy access to campsites, services stations and other amenities that are RV friendly, so why would you want to replace your GPS unit with a smartphone app? Many travelers are taking advantage of the free GPS apps that are available for most smartphones. 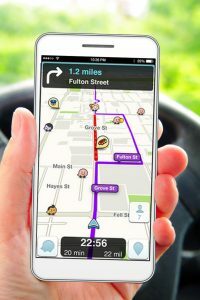 Google and Apple Maps are two apps popular with drivers, along with Waze and MapQuest. These apps are capable of providing you with accurate maps and most come with audible directions, along with the ability to alert you when you are approaching safety and traffic cameras. 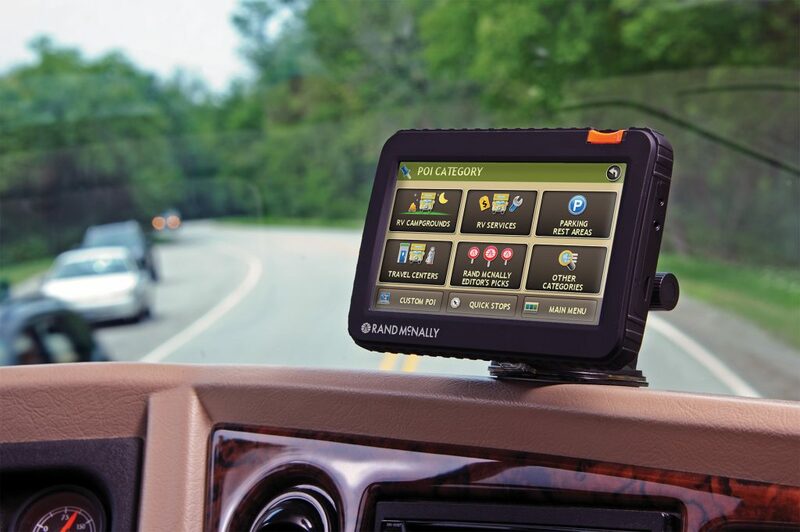 While these smartphone apps can get you to your destination there are still several reasons why you might not want to get rid of your RV GPS. 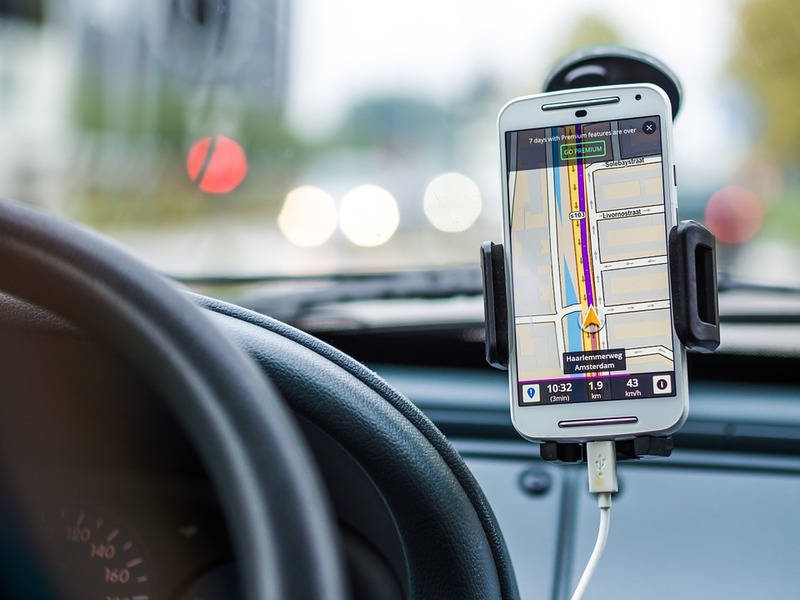 The main benefit of a smartphone app is that you will receive traffic and map updates faster than a standalone unit and this can make it easier to get to your destination. Other than that, chances are you will want to stick with your RV GPS especially on long road trips. Most smartphone apps are not designed for you to input the specific information about your vehicle, and this is important when you are driving a large RV. A GPS device for RVs will help you avoid roads that are too narrow to drive on safely, along with any areas where large vehicles might be restricted. Unless you downloaded the GPS app to your tablet the small screen on your smartphone is usually hard to see when you are driving, and this can be dangerous. This is rarely a problem with an RV GPS since you can find some with screens measuring up to 7 inches. You also do not get the same information from an app. Most GPS units will display your current and posted speeds, and will alert you whenever it changes. Not only is this a convenient safety feature, it can also help you avoid expensive speeding tickets. Most smartphone apps are currently only able to provide one route with a starting and ending point, while RV GPS units are able to display it in segments. This allows you to easily plan for stops without having to input your information again. These apps also take a toll on your smartphone’s battery, and its’ small speaker makes it almost impossible to hear the audible alerts when you are driving. Not only will you need to purchase an additional speaker, you will also need to find a mount that is compatible with your smartphone. While RV GPS units come with a convenient mount for “hands free” use, the same is not true with most smartphones. Even though there are a few advantages to downloading one of these apps to your smartphone, they are still not enough to replace the convenience and accuracy that you get with a RV GPS device. What is an RV GPS? An RV GPS is a device that provides you with directions when travelling. The GPS (Global Positioning System) device uses the Global Navigation Satellite System to calculate distances and specific locations by intercepting microwave systems coming from satellites. Though in the beginning the GPS was designed for military purposes, today, most drivers use one, in order to be able to reach distant locations without getting lost. The majority of these devices will not only calculate the distance between two points and provide you with direction indications, but will also approximate the time it will take you to arrive there and, to prevent you from being distracted from driving, they will audio instruct you while you are on your way to a specific destination. RV devices are especially designed to be installed in a RV. One such item should be built with the main purpose of helping your vehicle find the best RV routes, parks and campgrounds. Of course, if you live the whole time in one, it is mandatory that you possess an especially designed GPS that will help you save gas and time when travelling from one place to another. Who makes the best RV GPS units? There are many manufacturers that have dedicated their resources to the fabrication of RV GPS units and that is why it is difficult to reduce their number to a single name. But, if it were to choose a specific brand, you should probably rely on renowned brands such as Garmin, Randy McNell or Magellan that put a lot of effort and professionalism in creating new devices that use today’s newest technologies and features. Many of these products include the already classical features of a GPS unit, but allow you to connect your GPS to your iPhone, perform internet searches, offer you regular updates on traffic or possible road blocks caused by accidents and will check for auto shops. In addition, they will allow you to choose from several trajectories that are best for an RV. 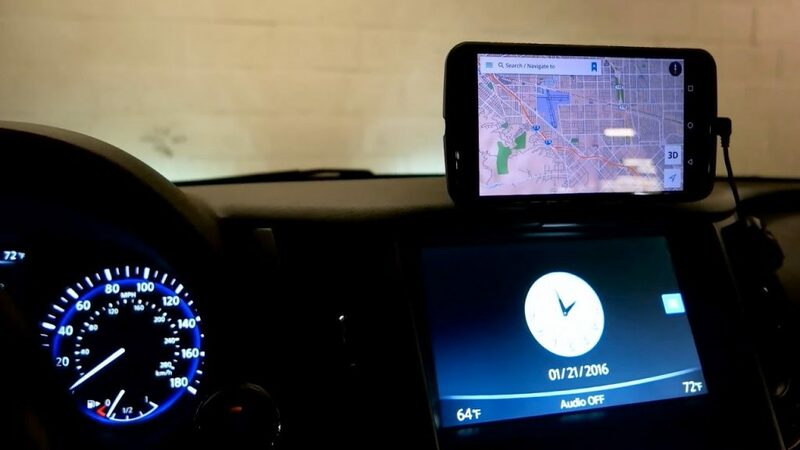 If you have regular places to go at different intervals, the GPS will memorize the route and, when you revisit a destination you just need to search it in the memory of your device and it will show up on its screen. Quite useful for users is the RV GPS’s predictive function that will show you a number of locations matching your search when you type the first letters of a place or city. Great GPS units will function using your vehicles socket, but will be fitted with a rechargeable battery for the cases in which you want to find your way back to your RV. However, batteries will keep your device running for maximum 3 or 4 hours. Why is an RV GPS useful? By providing you with all these benefits RV GPS units can make travelling days a lot easier for you. You will get to the wanted location faster, and without the usual nerve-racking situations that come up when going to an unfamiliar destination. It is really worth investing in a quality product and not in one that offers only basic tracking features. Where can I buy RV GPS units? RV GPS are commercialized in most electronic stores, but, if you want a specific product, designed for RVs, you should search the internet for the best offers. Who invented the RV or motor home? Recreational vehicles have been driving around North America since 1910 when campers were built onto the bodies of cars and trucks. By the start of the 1920’s RV parks were popping up across the United States, even though there were few established campsites and the majority of the nation’s roads were still unpaved. RVs are even more popular today and can be customized to fit any taste, style or budget, but before you go and invest in a motorhome it might be nice to know a little bit about the history behind them. The first RV introduced to the public was the Pierce-Arrow Touring Landau. Debuting in 1910 at New York City’s famed Madison Square Garden the Landau helped to reinvent how Americans went camping. The back seat of the RV folded down into a semi comfortable bed. The back of the driver’s seat could even fold down to reveal a small sink and chamber pot. The driver could even stay in touch with his passengers through a conveniently placed telephone. The Landau wasn’t the only motorhome rolling off of the assembly in 1910, two other manufacturers were also producing their own RVs. Los Angeles Trailer Works and Auto-Kamp Trailers also began manufacturing the small “auto campers”, along with several other companies. By 1919 motorhomes were so popular with consumers that RV owners had even formed their own club. Complete with a secret handshake, initiation ceremonies and even an official song, with 150,000 members by the mid 1930’s it seemed like RVs were here to stay. Known as the Tin Can Tourists, which refers to the way they used to heat tin cans of food over small gasoline stoves, many Americans depended on their RVs after the devastating stock market crash in 1929. While the depression era did cause a slump in RV sales, the popularity of the vehicles never truly went away. Once the Great Depression and WWII were over, Americans were ready to start touring the country again. RVs provided young GIs and their families with an inexpensive way to vacation and travel, and by the 1960s there was even a mostly completed national highway system for Americans to enjoy. When Winnebago began manufacturing RVs measuring from 16 feet up to 27 feet, the way Americans traveled and camped together radically changed. First released in 1967, the new RVs were roomier, more comfortable, and even easier to drive. Since then recreational vehicles have been rapidly evolving to keep up with today’s changing technology. Now consumers can customize their RV to meet their needs, and there is very little that can’t be included in one if you can afford it. What should you consider before buying a motor home? Once you know the average length of your trips it is time to take a few minutes and consider the different types of RVs. Class A motor homes are the largest, and some people even find them comfortable enough to live in year round. Class B models typically resemble a van and some are large enough to sleep up to four people. Class C RVs are the perfect mix between a full size model and a smaller van style one. Since the size can vary it is relatively easy to find a Class C motor home large enough for your family. Travel and fifth wheel trailers are similar to Class A RVs except they are designed to easily hook onto the back of your pickup truck. Pop up trailer are lightweight, easy to tow and relatively inexpensive, while a truck camper is the perfect choice for adventurous campers. A truck camper easily slides into the bed of the pickup truck so you can take your “campsite” with you almost anywhere. Once you’ve purchased an RV you will quickly realize that there are additional costs, and if these aren’t figured into your budget ahead of time the motor home could end up being too expensive to drive. Some of the costs to consider include maintenance and mileage. Larger RVs are typically more expensive to maintain, and all have poor milage ratings. The cost of insurance should also be considered, and it is required by law if the RV is financed through a FDIC bank or credit union. Additional features that you can’t live without can also cause the final cost of the RV to go up. While extra features will increase the price of the RV, there are some that you will certainly want to consider. If you are towing the motor home you will want to make sure that it comes with the necessary equipment, and that it is compatible with your truck or SUV. Kitchenettes are important if you plan on camping in remote locations or if you simply don’t want to have to find a restaurant every time you want to eat. Connectivity is another important feature to consider, and most RVs can easily be Wi-Fi enabled. First RVers might want to consider renting a motor home before buying one. Not only does this give you a chance to try one out, you can also see if traveling and camping in an RV is something that you will want to do. Once the lease agreement is up and if you’ve decided that you’ve enjoyed your RV experience you can purchase the right one for you with complete confidence. What motor home is right for you? When it comes to choosing a motor home it can be confusing. Not only do you have to decide if you want a motorized RV or a towable camper, but you also have to figure out the type or class. If you know that you want an RV but aren’t sure what type the following information should be able to help you make the right decision. These are the largest types of RVs, and in some cases the highest priced. Customers can choose from a variety of styles and sizes, and Class A models often come with most of the features you would typically find in a stationary home. An assortment of extras can also be added so consumers can customize it to their exact specifications, and you can even choose between a gas or diesel engine. Most Class B motor homes resemble a van but thanks to its creative design can comfortably sleep up to four people, in some cases. Some allow for the ceiling or floor to be raised or lowered to provide additional headroom, while others come with a convenient table that can also be converted into a bed. 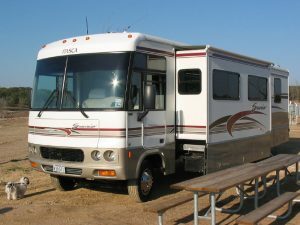 Class C motor homes are similar in design to the larger Class A models but the smaller size makes these RVs easier to drive. Typically built onto a truck chassis, Class C RVs are often priced a little lower. If you want the comfort of sleeping indoors when you are camping and don’t want to be limited to an RV park, a truck camper might be the perfect choice for you. The camper is designed to sit securely on the back of your pickup truck, and since the hitch is still free you can still tow a small boat or other offroad vehicles. Almost all truck campers come with all of the amenities that you will need,including a bed and small kitchenette. First time RVers and occasional campers often choose an inexpensive and easy to use pop-up camper. The canvas sides are easy to prop up when you are ready to stop for the night, and will quickly fold back down to a manageable 4 feet in height when it’s time to go in the morning. Along with sleeping and dining areas, some higher priced models even come with functioning toilets and showers. Since these campers are lightweight and compact when folded down they can be easily towed by most cars and SUVs, along with pickup trucks. Generally easy to hook up to a pickup or SUV a travel trailer comes with many of the same features as a full size RV, only in a smaller package. 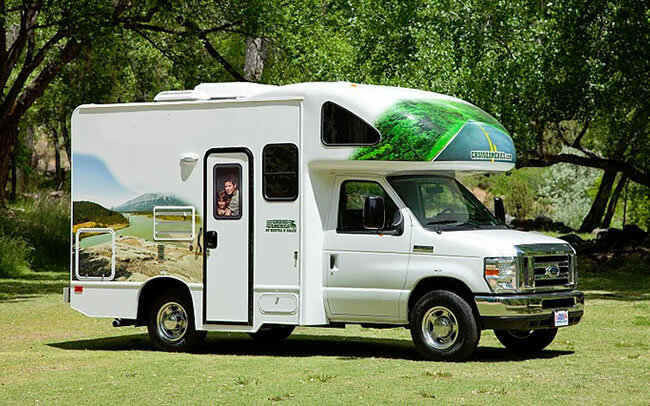 Customers can choose from a variety of styles and floor plans, and with the addition of slideouts a travel trailer can also accommodate several people comfortably. It’s not uncommon for people interested in recreational vehicles to start off with a travel trailer before moving up to a large RV. Designed for stability when it is being towed, a fifth wheel can give you the comfort and room of an RV. Since a fifth wheel can be unhooked without danger of tipping over, you can easily leave it at the campsite while you are driving around. With the addition of slideouts a fifth wheel can easily sleep four people, and it can even be customized to your specifications. Believe it or not RVs are actually designed to be relatively easy to drive, but if it is your first time behind the wheel these large vehicles can be intimidating. There will be times when knowing certain driving techniques will come in handy, especially when you are trying to maneuver into a parking space, and the following tips will help give you the confidence you need to drive your RV almost anywhere. Before you even put the key in the ignition it is important to thoroughly read the owner’s manual that came with the RV. There are several pieces of information included in it that you need to know in order to safely maneuver the vehicle around. Knowing the length of your RV is essential for safe driving. If you don’t know how long the vehicle you will never be completely sure that you will fit in a parking space, even if you are fortunate enough to own a rear view camera. It is also important to remember that the back of the RV will swing wide during turns, and if you don’t know the length chances are you will end up damaging the vehicle. The width of the RV might take some getting used to. RVs are significantly wider than cars and most trucks, and this means that there might be some places that you can’t go. When you are looking for the width of the RV it is also important to take into account the rearview mirrors, and know exactly how far they stick out from the side. These mirrors are expensive to replace and can be easily broken if you try to maneuver the RV down some narrow roads. You need to know the height of the RV to avoid being stuck under a low overpass or bridge, and the weight is also important to know so you can plan your route around certain restrictions. The RV’s weight also affects how quickly it can stop and speed up, which should always be factored into any decision you make when you are driving. If you are planning on parallel parking your RV, you will probably give that idea up after you see just how large the vehicle really is. You can safely back into a parking spot if you take your time and pay close attention to what is going on around round. Rear view mirrors and cameras can help guide you into a spot, and don’t be afraid to get out and check on your parking job. Navigating city streets can be stressful, which is why it is always a good idea to have your route planned out in advance. Try to avoid high traffic areas and neighborhoods with narrow streets, and remember to turn from the outside lane to avoid clipping your bumper on streets signs and lamp posts. Driving an RV in the mountains comes with its own set of challenges. The weight of the vehicle will slow you down going up steep inclines, and it can also cause it to take longer for the RV to come to a complete stop. Driving through the mountains can put strain on the engine so it is important to take it slow, especially going uphill. Try to avoid narrow and curvy mountain roads when you can, simply as a safety precaution. Easily the preferred mode of camping for most retirees or seniors, RVing lets you enjoy the fresh air without the need to pitch a tent or sleep outside. Your grandchildren can easily tag along so you can enjoy precious bonding in your house on wheels. There are senior-oriented and seniors-only campgrounds designed for campers over the age of 55, so you are never short on options. These locations have their own attraction for the senior crowd and can be found via really helpful sites online. 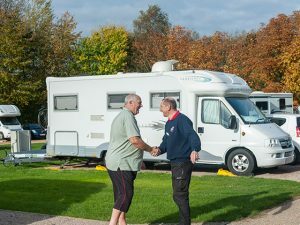 Retirement can be spent holidaying in rented RV units, and this can be a cost efficient means to spend holiday weekends. Make sure to find campgrounds that accommodate RVs. Plan way ahead so you can get more affordable rates. Don’t be too embarrassed to ask about senior rates, if they are available. Give a copy of your route and itinerary to family and trusted friends so they know where you are at specific times. Remember that RVing will involve driving, and that the task itself can be challenging. You will have to be in your optimal driving mode since driving an RV is many shades different to driving a small car. Get plenty of sleep the night prior to the trip if you are going to serve as the driver, or if you will be driven by another person, make sure they are physically prepared for what can be a long drive ahead to your destination. Better yet, choose less distant destinations to prevent overly stressing the driver. Use a suitable RV type for the kind of adventure you are planning to have. A fifth wheel configuration lets you drive a truck to explore locations while letting you detach the RV for convenience. A pop-up trailer is fantastic for long weekend holidays but not for extended excursions, as it simply enables you to avoid sleeping directly on the ground or eating out every night. When you are planning to be on a roadtrip for a long period, you will need to have the conveniences of home with you. Consider water and electricity in these terms: many RV campgrounds offer hookups to them that can easily add up but the convenience to having access to them is well worth the cost. Be sure to consider dumping stations as well. Before you hit the road, think about any of your specific medical needs to ensure that your journey will be less stressful. Talk to your doctor before your trip and seek approval first. This can prove to be extra valuable when planning your routes. Why? If you need to be within range of emergency medical services, this can be factored in. If there are refill prescriptions to think about, this can save lots of trouble for you and your companions. It will also mean not taking out-of-the-grid trips for you. There should be sufficient cell coverage in anticipation of any eventuality on the road. 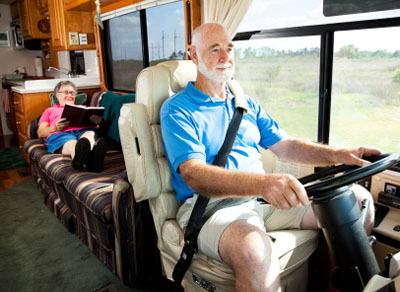 Although RV communities are friendly, you can never tell what other kinds of people you will encounter on the road, and there are always plenty who will take advantage of the fact that you are seniors and are less capable of fully protecting yourself and your companions. The general door locks should be checked by a locksmith before you head out on your journey. You can add alarms to the windows and doors for greater security and also double-check before answering summons to the door. Experienced RVers prefer to park overnight in campgrounds with security guards.